Home > Arts & Life > Plastic, not so fantastic? The millennial generation is commonly referred to as the most narcissistic generation the world has yet to see. An obsession with all things material, crippling vanity and an insatiable need for validation are our generation’s defining traits. Statistics show the contrary. Among high school students, 44 percent of girls and 15 percent of boys are attempting to lose weight, according to a 2014 study regarding self esteem and image conducted by the Council on Alcoholism and Drug Abuse. Dove’s Campaign for Real Beauty found in 2014 that as many as seven out of 10 girls believe they don’t measure up in some way, particularly in the arena of physical appearance. The standards Barbie sets have damaged many, but for others like Valeria Lukyanova, they have taken precedence over all else. Ukrainian model Lukyanova, or the “human barbie” as she is often referred to, became a viral sensation for her striking resemblance to the doll. 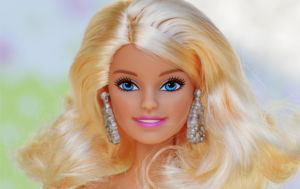 Her tiny waist, long blonde hair and wide, doll-like eyes make her a perfect likeness to Barbie. Lukyanova claims she came by her features naturally and has yet to undergo plastic surgery, though in a 2016 interview with Cosmopolitan she said she’s not ruling it out. “In the future if I require it for my body, then of course, I am not against surgery,” she said. Lukyanova is just one of countless examples of women social media and the fashion industry celebrate. Opening Instagram’s “popular page” reveals post after post of models in edited pictures posing with huge smiles that seem to say that number of likes some how equate to ideal beauty. Thankfully, those posts aren’t the only ones that are trending. Plus-sized model Diana Sirokai is a social media sensation after posting pictures from her stunning copy-cat photoshoot of Kim Kardashian-West’s famed white swimsuit photoshoot. “My flaws are my power” read the caption of one of Sirokai’s posts. Another caption read “10 Things to tell yourself every morning before starting off your day. I am healthy, I am strong, I am powerful, I am happy, I am blessed, I am wealthy, I am grateful, today I am a better version of myself than yesterday, I can do it, I am loved.” Combined, Sirokai’s three body-positive posts garnered over 71,000 likes. Stefanie Alia, a junior physcial therapy major, overheard girls reacting to Sirokai’s replication of Kardashian-West’s photoshoot. Even today there is still so much room for improvement in terms of representation and recognition for the variety of beauty in the world. From body types to skin tones, society is slowly realizing that beauty does not have to look like Barbie. Fashion designer and 2008 “Project Runway” winner Christian Siriano has recently asserted that there’s no reason that even Barbie needs to look like Barbie. Well renowned for designing for women of all shapes and ethnicities, Siriano has recently partnered with Barbie’s parent company to launch a line of inclusive Barbie dolls. These dolls are modeled after celebrities Siriano has designed for, including Sarah Hyland, Leslie Jones and Solange Knowles. Sirokai and Siriano are just two of so many millennials defying stereotypes, promoting diversity and proving that self love is necessary, not narcissistic.